The Aquascape RainXchange™ System is a revolutionary design that combines a recirculating decorative water feature with a sub-surface rainwater harvest storage system. Traditional methods of harvesting rainwater do not add beauty to your home or office setting. The RainXchange™ adds the beauty of a water feature to an efficient system for capturing, filtering, and reusing our most precious resource - water! Whether you choose a Pondless® Waterfall or bubbling urn to your landscape, you'll be happy knowing your RainXchange™ System not only looks great, but is beneficial for the environment, too. Because the water stored in the RainXchange™ System is constantly moving and being aerated, it becomes a sanctuary for wildlife. Birds, frogs, dragonflies and butterflies all flock to water in the landscape. In fact, water is a key component in certified wildlife habitats. Capturing rainwater to operate a decorative water feature creates true self-sustainability, drastically reducing the need for chemically-treated traditional water sources. While you enjoy the benefits of a decorative water feature, the RainXchangeâ„¢ System filters the stored water to prevent stagnation and growth of unhealthy bacteria. 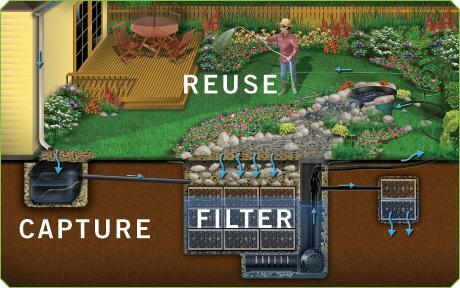 Accessing the stored underground water is easy as connecting a hose to a spigot. A small pump is connected to the stored water making it convenient for you to water the landscape. Click to learn more about Aquascape. Click to learn more about Pond Services.